Beautifully designed websites that work on all devices and are built for purpose using the latest in web technologies. We like to keep things exciting and recognisable which is why each and every creation is a piece of art to be admired. Customised database and data storage solutions that allow your business to thrive and expand with ease. In our modern and connected world mobile applications allow you to reach more people than ever before. We’re a web design and development agency based in London that provides smashingly creative websites and data solutions that are unique and help you reach out to a wider audience. 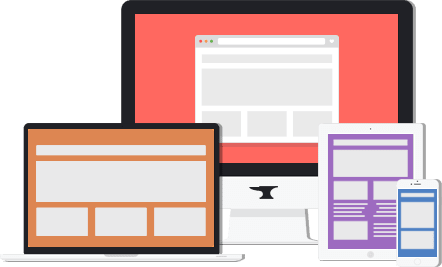 Responsive design is used in all of the websites we create, meaning no matter what device is used to visit the websites we create the site will have the same functionality and user experience. We work with everyone from start-ups to large businesses and even individuals to want to push their ideas out to the world! If you have an idea for a website, or want to reach out to more people from all around the world - we have you covered. At LogicForge we love the web and all that it can provide for our world, which is why we only use the latest technologies in our web, mobile and database development. This ensures that everything that we do can use the fastest available methods and have in-depth user experiences that wouldn’t be possible otherwise. All fields that are marked with a star are required. Don’t want to use our form? Just shoot us an email: hello@logicforge.co.uk, or get in touch on one of the networks below.